Four County Little League depends upon volunteer umpires to officiate games in the Minors, Majors, Intermediate and Juniors Divisions. Umpiring is great fun and is as much a part of the game as playing itself. If you are interested in volunteering, please make your interest known by indicating on the player registration form during registration or by emailing the FCLL Umpire in Chief at umpire@fcllbaseball.org. It is a rewarding feeling to walk off the field after a game, knowing that you have made a difference in the Little League experience of our players. A trained umpire can, and does, inspire children to abide by the rules and to recognize authority while at the same time increasing enjoyment of the game. We encourage all who are interested to try it. Additionally, we expect everyone to be supportive of our umpires at games and remember, before you yell at "blue" behind the plate, ask yourself, "Could I make the right call from my seat"? And if the umpiring skills are not what you think they should be, we'll gladly sign you up! Character, good judgment, ability to get along with youngsters and the desire to do the job well are the attributes of a good umpire. 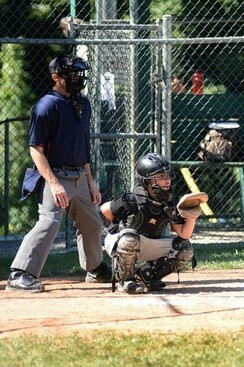 This is only part of what it takes to be a Little League umpire. The adult volunteer is also a person who commands respect, knows the rules of the game and reacts intuitively to play situations that dictate the umpire’s position. First and foremost, the safety of the children and the integrity of the game must be number one in the umpire’s mind and how he enforces and interprets the rules. Since the advent of baseball, the umpire has occupied a unique role. As sole judge and jury the umpire’s authority is unquestioned, but the dignity with which each umpire exercises his duties, the good judgment and common sense he applies in the interpretation of the Rule Book are the hallmarks of an efficient and well respected official. The theory that paying umpires guarantees competence is not only fallacious, but also contrary to Little League policies. It is also a fallacy to believe that because an umpire is a volunteer he could not be as professional in his umpiring mechanics and knowledge of the rules as any major league umpire. When you accept the responsibility of a volunteer Little League Umpire and are appointed by the league president, you should recognize and accept that you are a representative of FCLL and Little League Baseball. You are authorized and required to enforce all the rules and regulations of Little League Baseball, Inc. Whether we agree with all the rules and regulations or not, we must enforce all of them to the best of our ability - we cannot pick and choose which ones we are going to enforce. The Little League Volunteer Umpire is perhaps one of the most important volunteers in the local league structure. If you are interested in becoming an umpire or attending one of the umpire clinics please contact umpire@fcllbaseball.org.